Bryans lift their 3rd trophy of the 2016 season and 112th lifetime . . .
Bob Bryan and Mike Bryan have captured their fourth Italian Open, which represents a record setting 36th ATP World Tour Masters 1000 crown. The American twins defeated 8th seeds Vasek Pospisil and Jack Sock 2-6, 6-3, 10-7 in 71 minutes in a rain-interrupted final at the venerable Foro Italico in Rome. The Bryans improved to 112-53 in tour-level finals with their 22nd match win of the season. They split $252,096 in prize money and earned 1,000 Doubles Rankings points which will move them up to #3 for the season. Bob Bryan: "I would have never thought we would have got to that number of 112 career titles. It sounds crazy. When we won our first title back in 2001, we were looking at 10 - - - that was the brothers' record, held by Tim and Tom Gullikson. We beat that and we just kept going. Luckily we've been healthy. This feels good. We turned 38 last week and we're not young chicks any more. It's nice to get titles when we can and every one feels good." Pospisil and Sock raced to a 4-0 lead in the first set. The match was suspended due to rain with the Bryans leading 1-0 in the second set. Upon the resumption of play, the Bryans came out with more energy, got hot and broke twice to take a quick 5-1 lead. The Bryans won the first five points in the Match tie-break, but Pospisil and Sock worked their way back to a 7-8 deficit, but the Bryans then won both the points on their opponents serve to close out the TB, 10-7. Mike Bryan said, "The rain delay definitely helped us. Our coach (David Macpherson) was back in the locker room, where we had about 15 minutes, and he said, 'Fire it up!' We were kind of flat in the first set and weren't playing with a lot of energy. We had a late match and Bob went to bed at 3 in the morning. So we were kind of dazed and confused. We were bouncing around in the second set. We played a good Match tie-break, which can go either way." The Bryans, who were appearing in their seventh Rome final, completed their semi-final victory over Frenchmen Julien Benneteau and Edouard Roger-Vasselin at 1:09 a.m. on Sunday. "We're sharing a room this week," said Bob Bryan. "I fell asleep around 2:45 a.m., because Mike started snoring. We drank so much coffee last night that I was wired. It was a 12-hour turnaround. Our bodies don't turn around quickly anymore." The Bryans will now go their separate ways to prepare for Roland Garros, the second Grand Slam championship of the season. Mike Bryan said, "Bob's going to go back to Miami to see his wife and three kids. He'll be on the ground for three days. Hopefully he's going first class to lay out and recover. I'll be spending time in London, then off to Paris. We'll head to the gym and hit the courts a lot. I think we're playing great right now, we're healthy, mentally fresh and happy since winning this. We just want to keep the momentum going." Bob Bryan added, "It's a massive goal of ours to win another Slam. We want to do it this year. We've still got lofty goals, we're not lowering the bar. We still want to finish No. 1, win Slams, the Olympics. We want to do it all. We're very hungry. It's been a quiet six months. This year, we've won a 250 (Houston), 500 (Barcelona) and now a Masters 1000 (Rome). The next step is a Slam . . ." Excerpted from ATP World Tour. *** The Bros. wins at the Italian Open included: Stevie Johnson-Sam Querrey (USA), 4-6, 6-3, 13-11; Jamie Murray (Scotland)-Bruno Soares (Brazil), 6-3, 6-4; Julien Benneteau-Edouard Roger Vasselin (France), 6-7, 6-2, 10-7; and Vasek Pospisil (Canada)-Jack Sock (USA), 2-6, 6-3, 10-7. *** Mike and Bob were happy and proud to receive their awards after the match from the Hall of Famer and all-time great Stan Smith. Stan the Man has been a mentor and supporter of the Bros. since Jump Street and his son Ramsey, who is now the tennis coach at Duke, grew up with them in the juniors and is a close friend. 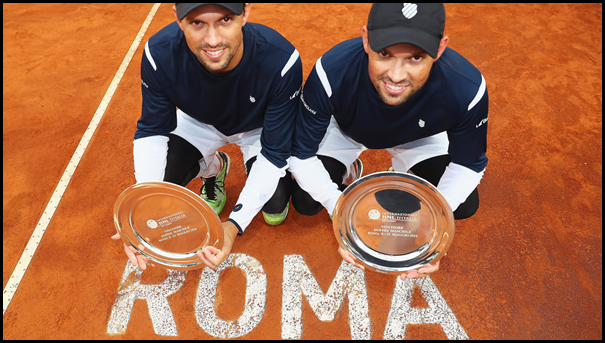 *** The Bryans dedicated their win at Rome to Tom Bruno, who is recovering from heart surgery. Tom, the President of the VCM, along with Jimmy the G Gucciardo, the VP of the VCM, and Gary Cuoco, the Secretary-Treasurer of the VCM, instilled in the twins, at a very young age, a belief that the Italian Open was the most important and prestigious title they could ever win - - - more important the Davis Cup, Wimbledon, the US Open or the Olympics . . .
*** The Bros. have now won three of their last five tournaments, with a record of 13-2. *** The Davis Cup Quarter Finals, USC vs. Croatia, will be held in Portland on the weekend of July 15-17, and the Bryan Brothers Foundation will once again be sending some deserving juniors to this big match and early morning workouts. Terry Lynch of the VCJTA, CathyAnn Simon of the SBTP, and Ryan Wolfington and Trent Alenik of the Intermountain USTA are always so very helpful with our Davis Cup trips. *** The Tennis Fest is slated for Sunday, Sept. 25 at the fabulous Spanish Hills Country Club in Camarillo and besides Mike and Bob, this year’s fund raiser for the Bryan Brothers Foundation will feature big John Isner, Stevie Johnson and Mardy Fish, along with all-time American great like Ricky Leach, Hank Pfister, and Jeff Tarango. And we are hoping to once again have Kaley Cuoco and Tracy Austin. The event is headed up by SHCC Head Pro and Tennis Director Dave McKinney who is assisted by Brian Giffin and Sean Callaghan. The 1,000 seat stadium always sells out for this fun event and there are only 12 spots for the Pro Am which always fills up immediately. *** The Bros. will be playing Exhibitions in Austin, Texas at the Lakeway World of Tennis on Friday, Sept. 23 and in Midland, Texas at the Bush Tennis Center on Saturday, Sept. 24. The Bryan Bros. Band featuring Counting Crows drummer Jim Bogios, George Holdcroft, Dan DeShara and Jimmy Wolff will perform after each Exo. Thanks to Tim Stallard for putting on the events and supplying the private jet to get the guys from Austin to Midland to Camarillo on this whirlwind three day swing. *** Coach Bryan will again emcee the prestigious Beverly Hills Invitational on Sunday, May 22. The event is held at the picturesque mansion of Geoff Palmer and is headed up by former UCLA All American and NCAA Finalist and tour player and coach, Tony Elvis Graham. Lots of former tour players and celebs turn out for this gala. *** Coach Bryan will be doing emcee work and tennis clinics at the Atlanta and Washington DC Tournaments this Summer. If you are anywhere neat these two great events make plans to come out. The BB&T is July 31-Aug. 7: http://www.bbtatlantaopen.com/ And the Citi Open is July 16-24: http://www.citiopentennis.com/ He will also do events in and around Cincy and the US Open. *** The entire Bryan Family sends along big congratulations to Bri Cuoco for being named to star in the leading role of Moulin Rouge in an extended run in Las Vegas. Bri is a wonderfully talented singer and dancer and a great young lady. *** We say bravo and well done to Nelson Emery on being named the full time tennis director at Ventura College. What a grand job he does for the players and for tennis each day. 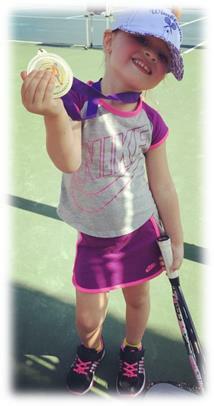 *** Four year-old Micaela Bubs Bryan won a Gold Medal at her tennis clinic last week in Miami and it was placed right beside her Dad’s Gold Medal from the London Olympic Games in 2012. The Bryan Bros. will be going for the Gold again at the Rio de Janeiro Olympics, Aug. 7-13. *** Mike ‘n Bob send along heartfelt congrats to their former Stanford teammate, Paul Goldstein, who coached the Cards to big wins over Notre Dame and then #14 seed Northwestern to advance to the Sweet 16 in the NCAAs. They also say well done to Billy Martin and Grant Chen and #1 player Mackie McDonald of the UCLA Bruins on advancing and being the #2 seeds. *** The Bros. were also happy to see Peter Smith and the USC Trojans win their regional and they say well done to Robbie Bellamy who won key matches for the team this past weekend at the beautifully refurbished stadium at SC. Robbie is the son of Tennis Channel founder, Steve, and his Mom, Beth, who was an All American and #1 player for SC before going out on the pro tour. *** Both the Cal Bear Teams under Peter Wright and Amanda Augustus, who traveled the junior trails with the twins, advanced and look for the Women to have a good shot at winning the Title next week. *** Coach Wayne Bryan felt that the UCSB Team, coached by Marty Davis and Blake Muller, had their best season in twenty years, finishing at #44 with a sparkling 17-7 record and winning the Big West Conference Championship.